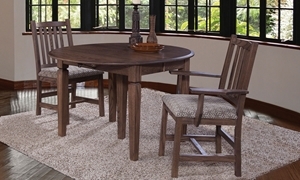 On-trend dining set crafted with earthy knotty oak veneers features a 118-inch trestle table, four side chairs and a pair of arm chairs. 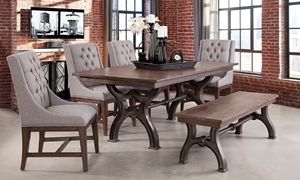 Light, contemporary dining set features 118-inch trestle table with matched knotty oak veneers and four upholstered side chairs. 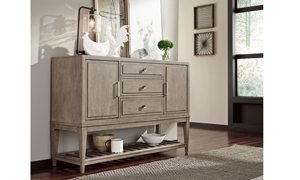 Contemporary sideboard is both chic and functional with two cabinets for wine storage, a drop front drawer and hidden serving tray. 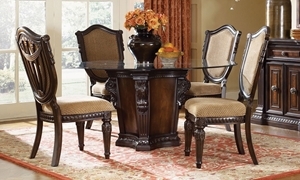 Classic dining set includes a 60-inch round glass-top table with an elegant carved pedestal base and four matching lute back side chairs. 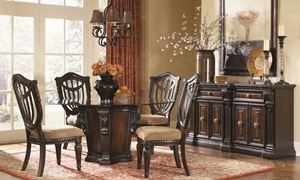 Classic dining set includes a 60-inch round glass-top table with elegant carved pedestal base and four upholstered lute back side chairs. 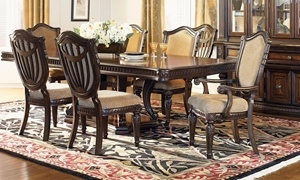 Sophisticated dining set includes a 108-inch shaped pedestal table with walnut inlays and four upholstered lute-back side chairs. 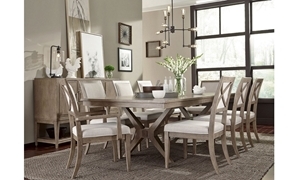 A pair of Parsons chairs in linen-look fabric elevates the subtle elegance of this 112-inch reverse scroll trestle table and 4 side chairs. 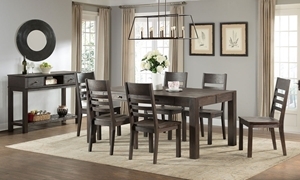 Acacia veneers in a dark ash finish lend allure to this 112-inch table with reverse scroll trestles and four matching lath back chairs.